Bryan loves video games, but one day he realizes that too much screen time might have consequences. Students will read the passage and answer follow-up questions about vocabulary and other story elements. Bryan loved to play video games. Every day after school, he walked home quickly and did his chores right away. He ate his snack while he finished his homework to save time. As soon as he was finished with his school assignments, Bryan was free to play video games until supper time. Bryan sat down on the sofa in front of the television and turned on his video game console. The console was a small white box that attached to the TV with a long cord. Bryan's dad said that inside the console were special computer chips that held all the video games Bryan liked. Bryan didn't really care how the video game console worked, though. He just liked to play the games. His favorites were racing games and adventure games. Bryan sat back on the couch and began to play. As Bryan was playing, his mom walked through the room to see what he was doing. "Don't let the video games turn you into a couch potato," Mom said. "If you're not careful, you'll sink into the couch and turn into a video game controller yourself one of these days." Bryan nodded and kept his eyes on the flashing television screen. He gripped his controller tightly and pushed the buttons hard. Soon, Bryan's hand began to hurt. He was having trouble moving his fingers. Bryan tried to stretch out his hand, but it felt like his fingers just wanted to curl back around the controller. Bryan settled back into the couch. It was so comfortable that he felt like he was sinking deeper into the cushions as he played. He felt a little thirsty, but it would be too much trouble to get up and pause the game. Then Bryan thought about what Mom had said. Was his body really becoming part of the couch? He tried to concentrate on his back and legs to feel where his body ended and the couch began, but he couldn't feel much of anything at all. Bryan looked down at his hands. They felt stiff now, and it seemed like they were stuck around the controller. Bryan swallowed nervously. Could he really be turning into a video game controller? Would he just disappear into the couch before supper? Suddenly, Bryan dropped the controller and made himself stand up. He stretched his arms up toward the ceiling and then reached his hands down to touch his toes. His body tingled as he moved. Bryan ran to the kitchen to tell his mom what had happened. "Well, at least we know that video games haven't ruined your imagination," Mom said. She chuckled, but Bryan still felt very serious. "I think I'll take a break from video games and go outside instead," Bryan said. And that's just what he did. 1. 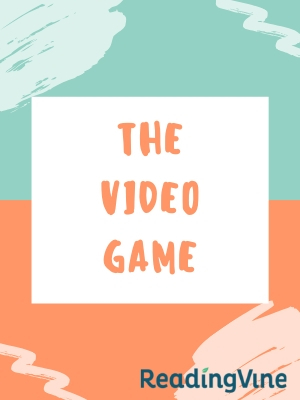 According to the story, what is a video game console? 2. What makes Bryan nervous while he plays video games? 3. What do you think Mom meant when she talked about Bryan's imagination? 4. Do you think Bryan has too much screen time? Why or why not?